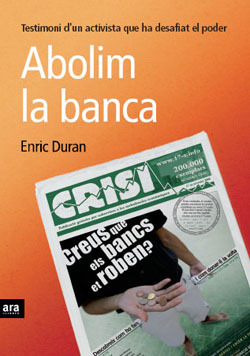 The book “Let’s abolish the bank” is a document on the action through which Enric Duran exposed the financial system by publicly explaining how he obtained 68 loans from 39 banks and how he subsequently used the money to finance those projects which are committed to create alternatives. It is, as well, a document on his ideological position, background and trajectory, started more than a decade ago in the anti globablisation movements. “I am writing these pages to make public that I have expropriated 492.000 euros from 39 banks, through 68 loans. If we include the interest accrued, the actual figure of the debt would be more than 500,000 euros, which I will not pay”. On the 17 of September of 2008, a peculiar newspaper was flooding the city of Barcelona: Crisi. Enric Duran, a young militant, revealed in this paper how he had expropriated 492,000 from various national banks in order to re vindicate a new style of civil disobedience in the current economic situation.”When consumerism and financial speculation are the dominant forces in our society, what’s better than to rob those who rob us and share the money amongst those groups which are commited to build alternatives?”. A story of rebelliousness against the actual economic system.